The sign outside the door to Donald Brink's San Clemente shaping bay reads: "Talk to your shaper about your foot today". No, Brink doesn't moonlight as a podiatrist fixing bunions on aging surfers, but rather his shaping philosophy stems from how surfers stand on their surfboards. The connection between foot and fibreglass is Brink's Ground Zero and it informs everything he makes. 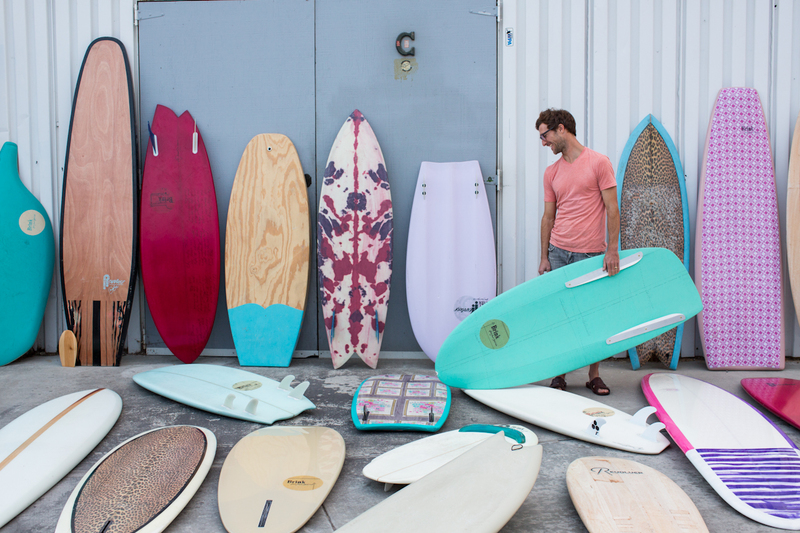 Originally from Cape Town, South Africa, Brink takes a creative approach to surfboard design. 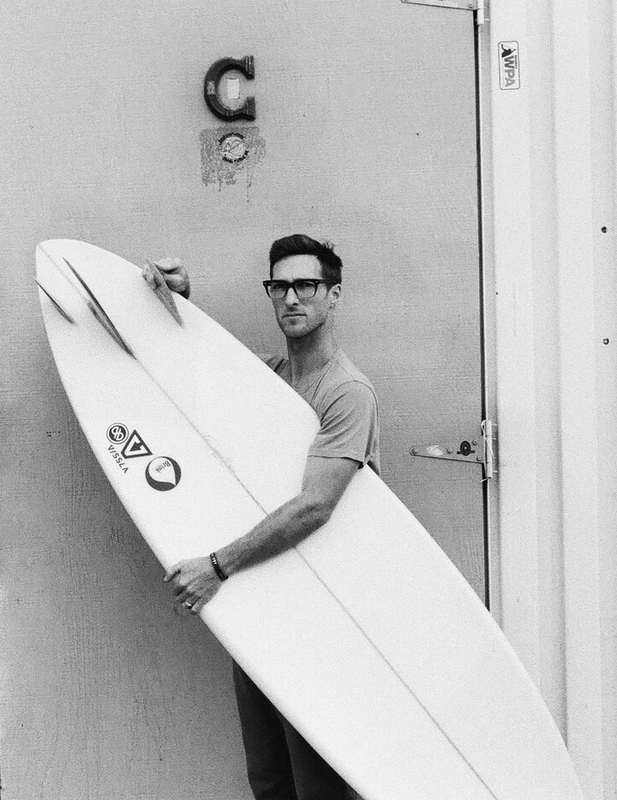 It's a 'feet first' approach that's led him down the path of asymmetrical design, making boards that have won him fans the world over. 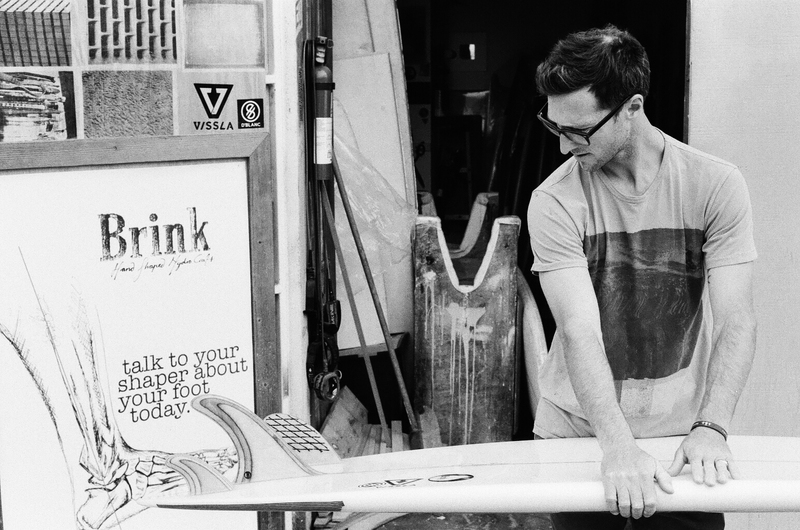 Donald Brink is also a brand ambassador for Vissla who recently flew him out here for a shaping tour. He's been sharing ideas, and shaping bays, with shapers such as Hayden Cox, Chris Garrett, and Jack Knight. Swellnet caught up with Brink to talk about asymmetry as functional design. You're originally from South Africa but now reside in California. How did you end up there? Yes, originally from Cape Town. I was in the music industry and I was touring the world with some good mates. We went all over. We went to America and we did a bunch of projects over there and ended up in San Clemente where we signed a record deal. We got established there and it became home. It was neat to land in that town. I’d been building boards back home so I knew what San Clemente meant in terms of surf history. Just to get there, let alone stay there, was amazing. It’s the hub of the board building industry in California. It’s a long way from Cape Town but you landed on your feet. Yeah, and I kind of got the back door in. I met my wife there, and her family knew a bunch of people that were connected with the surf community and they gave me a grand overview of what was going on in that town. Still, for me it was very rudimentary. I was shaping, sanding, glassing, and building my boards from start to finish in a garage. You’re known for your asymmetrical designs. When did you begin shaping them? When I moved to California. I was shocked by the lack of variety in the waves. The waves themselves could be fun but the retro equipment that’s so popular there put limitations on how well you could surf in those conditions. Take a fish for example, it’s a most beautiful sensation frontside, but for most people it is difficult coming onto your backside turn. So I started approaching those designs with the thought that I could improve them using the asymmetrical advantage. There are a few different theories on asymmetry. What’s yours? I make stance specific surfboards. There are different ways to approach the design, for instance, the way a wave is breaking. But for me I approach it with appreciation to which way someone is standing and the limitations of their weight distribution from heel to toe. Then I look to either enhance or promote those benefits so they can lever in and out of a turn. I also try and combat some of the frustrations. What percentage of boards that you shape are asymmetrical? Well I shape anything but the percentage is probably around 75% asymmetrical. Definitely the traditional, triple-stringer style of longboard are the most symmetrical. I still like shaping symmetrical boards because I grew up doing that. But then, consider this trip here to Australia, it doesn’t make any sense to be making a board that the machine next door can make much quicker. You make highly customised boards, yet you display some models on your website. How do you reconcile that? Well to be honest, I wouldn't put any models on my website if it were just up to me, yet the industry has gone down a path where we have models. So the conversation about namesake model is there and it’s never going to go away, therefore I treat models as a great way to start a conversation about your dream board - what sort of board intrigues or fascinates you. So the models help me figure out what your fascination is and what you’re trying to do with your dream board. That isn't a negative way to approach a design but it gets to a pro and con list pretty quickly. From there you can cherry pick from the models and come up with something better. So the models are best viewed as a starting point not an end point? To the untrained eye some of your boards may appear to be a bit unusual, but do you consider your concepts to be simple? I do. I seldom set out to make something avant garde. Some of my boards have appeared in shows and galleries but that’s not the point. I like to paint so if I’m going to hang something on the wall it’s going to be a pallete knife acrylic piece. 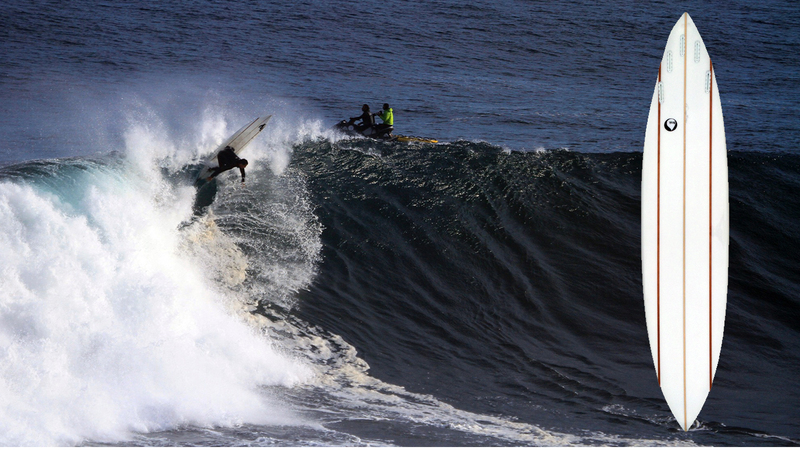 When it comes to surfboards, water flows following simple hydrodynamic principles. That happens in a predictable and simple way. And I feel like a board you love needs to be predictable and have a simple flow so that you’re able to do what you want on the wave canvas. This involves making a series of subtle changes that build upon each other…..and next thing it’s on Instagram with a white studio background and it looks absolutely weird but, like I said, that’s not the point. Can you give me an example of the subtle changes? For example, a slightly twisted rocker compliments a slightly fuller rail which allows me to have a smaller outline or shorter radius on my heel, which then lets me push the fin forward which makes it more sensitive which compliments the way I’ve twisted the rocker. Instead of making one massive change to a board, which is rather drastic, I’d rather make seven or eight changes that, to a small degree, depend on one another because a cohesive craft is my goal. To me that’s quite simple, and when you’re explaining this to somebody, like we're doing now, you can kinda unpack the puzzle. It's perceived as complicated but it’s not. It all starts with your heel or toe. Curious? If you want to find out more contact Donald Brink via his website. Interesting....but I'm not sure about it. Sometimes I dont even know why my boards do what they do, so I just wouldn't be confident I knew what they were doing if they were asymetrical. Some interesting boards in the gallery on the website. He also had some eye-catching boards at the recent board swap at Avalon, though as the above interview states, judging them purely on aesthetics sells his work short. Nothing about Donald's boards is abstract or 'interpretative'', each feature is functional and exists for a reason. Long as you keep an eye on the whole board, then isolating it into constituent parts helps understand how it all works. This has been my experience. I started riding asymms two years back, and I'd advise everyone to give it a go at some point. Gary, being a picture of physical symmetry, is curious about this asymmetrical thing: Who shapes your Asym boards Stu (the same person that shapes your symmetrical, or as I like to call them, 'Gary Boards'?) and have you ridden some from different Asymmetrical shapers? I see from previous posts that you have modelled the colour of your boards on Gary's running top. Thanks for the insight stunet, I'll definitely be trying one out at some stage. I'm just edging my way into asymmetry though I've spent the last two years fascinated by it. I've learnt a hell of a lot about design by paying acute attention to how features work from side to side. In that time I've had a couple of asymms from Chris Garrett and three from Stuart Paterson at PCC, each with subtle variations. I've been surfing Pato's boards for 25 years, so yeah, plenty of Gary Boards in that time. Next board's gonna be flesh tone, or more precisely 'flesh tone post solarium session', so you can strip your kit Gaz. Perfect camouflage colour choice, Stu.